Kahoot! – Who Knew Quizzes Could Be Such Fun? I love being introduced to products that immediately spark excitement in both teachers and students. Kahoot! 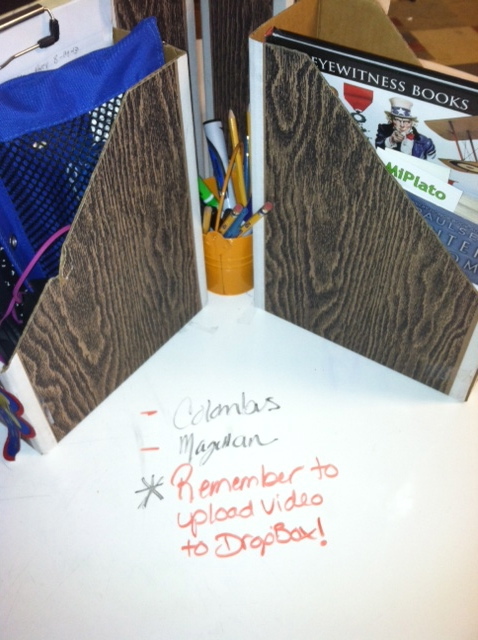 is one of those products that hooked me the moment Holly Clark had us play it at a recent GAFE Summit. Any device with a browser and internet connection can access this free, game based website which allows users to create quizzes, polls and surveys or search through a plethora of ready-made Kahoots in the public database. Kahoot! can be used as a formative assessment tool by creating quizzes that give students options to demonstrate their understanding of a concept. Once the quiz is complete, teachers have the ability to download results to a computer and even save to Google Drive to analyze when time allows. The quizzes have the option to create multiple choice or true/false questions, while discussions and surveys only allow for multiple choice options. Students can even create a free, under 16 account and build quizzes as a way to review, demonstrate understanding, etc. Student created Kahoot to review for a science test. What I love most about Kahoot is that once the activity starts, the site controls the students’ screens as the game progresses. Students are able to easily follow along with the game as they work to be the fastest to respond with the correct answer. The height of excitement reaches near breaking point as students are shown the leaderboard between questions and their true competitive spirit comes out. This is also true of adults when they participate during PD days. We are what we teach, right? After constantly being teased by multiple IT guys, teachers, my husband and finally students for the insane amount of tabs open on not one, but two of my browsers, I decided that I needed to get organized (again) and find a place to store all of the cool links that I stumble upon. My excuse had always been that I had a lot of research to do for teachers, which is why I often had 50+ tabs open. Deep down I knew that half of those tabs would not be viewed again for some time, but I still resisted the urge to close or bookmark them. I’m not sure what my aversion is with bookmarking, but it’s something that I could never quite get on board with. 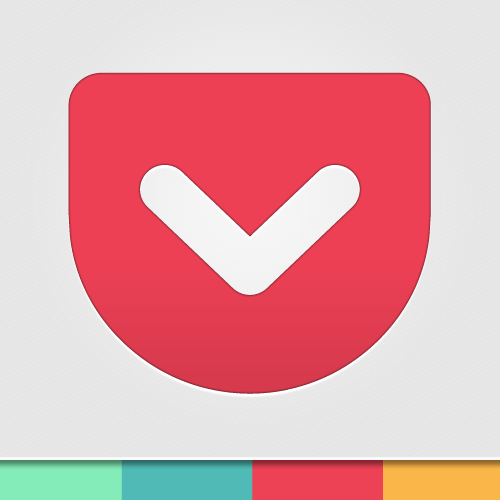 Pocket is a great website/app, which allows users to save links to articles, videos, pdf’s and more to Pocket. There are so many things that I love about this storage system, but what really sold me was the way that all of the saved items are beautifully displayed. I’m very much a visual person, so to only have lists of links was never beneficial to me. Below is a sneak peak at what my Pocket looks like and a few more reasons why I love it. Enjoy! Easily access your Pocket on multiple devices – Mac, iPad, iPhone, etc. Add Pocket as an extension to your Chrome Browser to quickly, “save to pocket”. Create Tags within your Pocket to get even more organized. 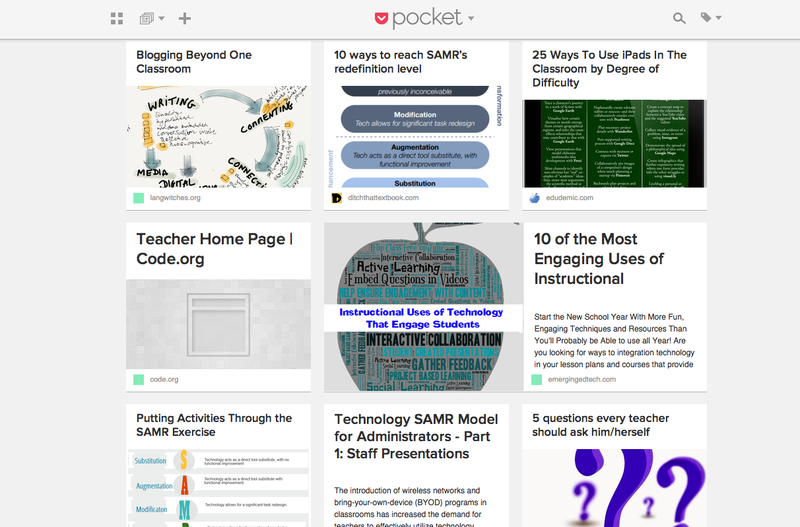 Share Pocket links via email, Twitter, Facebook and more! 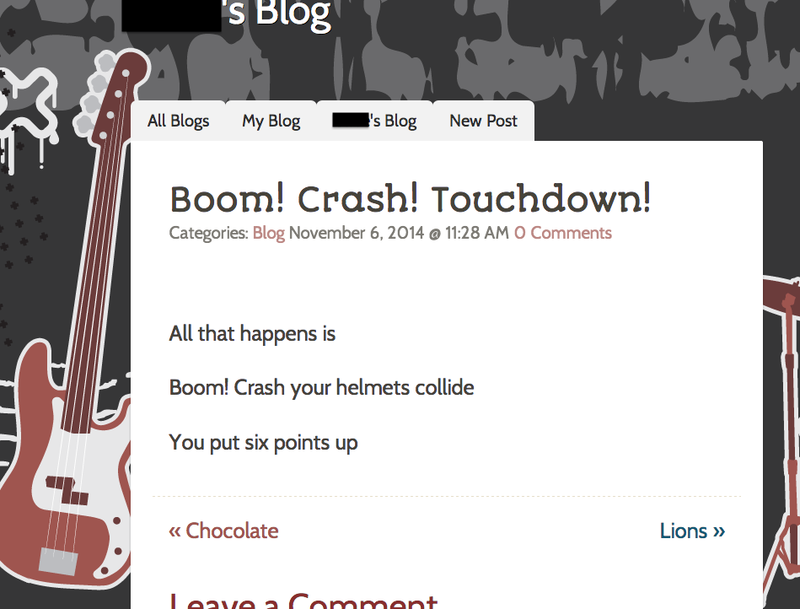 One topic that has been fresh on the mind lately is the idea of engaging students to write through a blog platform. I realize that blogging isn’t exactly innovative in this day and age, but to a lot of kids it’s just enough motivation to begin to express themselves in front of an authentic digital audience, while choosing what they want to write about to add to their digital footprint. Though blogging could and should be used for a number of different reasons, below are a few ideas to get started. A lot of our students are using KidBlog and Blogger, but with the abundant number of options to choose from, there’s no reason not to get your class blogging, today! For those unfamiliar with DOGO News , let me be the first to introduce you to this wonderful resource. After discovering this website, which is now available in the App Store, I immediately introduced it to my students. It didn’t take long for them to fall in love with it as much as I had. Over the years, I’ve used it for many different purposes and noticed such an increase in non-fiction comprehension. Once students had a choice of what article they were going to read about, they were hooked. They also loved the many features that DOGO News has to offer, such as videos, vocabulary, geography link and more. The website is constantly making improvements including adding Common Core connected lessons to most of the articles. One of the best parts about this website is that it is FREE! Teachers can use as many or as little of the resources that they want, though I recommend creating a free account and getting your class signed up as well. Below are a few quick ideas for how to take this resource and run with it. Give students choice! Let them choose an article and do whatever you would have had them do with an article that you were going to give them anyway. Practice commenting skills – Students can choose an article and post a comment focusing on some aspect of the article. Focus on current events – Kids love to read about what’s happening in the world. The best part about current event articles on DOGO News is that they can use the geography link to see where in the world the event is taking place. 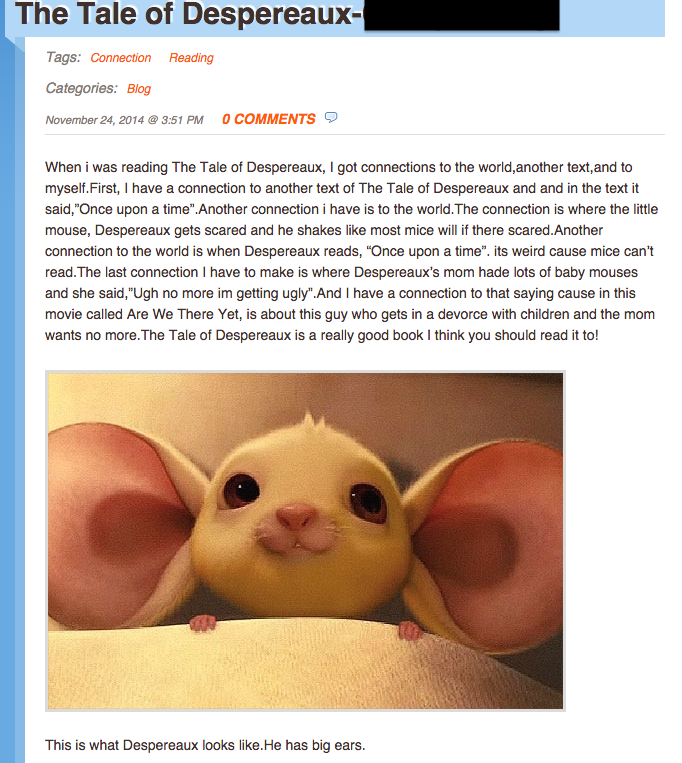 Write Reviews – Jazz up writing and show students how to construct and publish critical reviews of books and movies! Science Connection – Not only can kids read articles about inventions, phenomenons and more, but often they can watch videos of scientists being interviewed or the giant, undiscovered species that the article was focusing on. If you’d like more ideas, just leave me a comment or message me on Twitter! Looking for an idea for a parent night or even PD for teachers? If so, you may want to give “App Speed Dating” a whirl. Though it has nothing to do with dating, the idea behind this works like speed dating, where attendees rotate between quick, 3 minute demonstrations on an individual app. I stumbled on the idea after a daily dose of Twitter browsing, when Ms. Jennie Magiera tweeted that she organized this event for a teacher training day in her district. Immediately, I was drawn to the idea of students teaching teachers and knew that I needed to give it a try. So, a few weeks later, when a team of teachers asked me for advice on what to do for an open house, I knew I had to put App Speed Dating to the test. We pretty much whipped this together in 24 hours, but it was still a giant success! The kids were such great performers, parents were very engaged and teachers were delighted that they did not have to stand in the front of the room and “talk at” parents all night. For further detailed information, please see my website ,which outlines exactly how we set up the evening. The quicker a teacher realizes that more apps are not necessarily the answer, the better. I had to learn this lesson the hard way last year, after being sucked into the endless monster known as the App Store. I even went so far as to go “Google crazy”, wildly searching for “The Best Apps for Education” and “Top 50 Apps Every Educator Should Have”. No teacher should ever have 50 apps. Ever. I tell all of my teachers to focus on one app a week that they want to really use to the fullest of its ability and then integrate that app into as much as you can throughout the week. I’ve narrowed down my top five apps, that I know I would not want to live without. Check them out and have fun! This app is a screen casting app (which means it will record voice and movement) that can at the very least, be used as an interactive whiteboard. Explain Everything has the ability to import pictures, videos, PDF’s, Pages, Keynote documents and more. I used this app last year for quick, formative or extended formal assessments. Students would demonstrate their ability to solve, justify and defend a math problem, they would import pictures of a science experiment and narrate their results vs. their hypothesis and they would also import PDF’s to annotate over and demonstrate skills such as fluency, fact vs. opinion identification and so many more that I could never name in this small post. Subtext is a new app that I really wish would have been available last year, to use in my classroom. This app provides teachers with the ability to turn any book, article or document into interactive text. You can even find articles from places like DOGO News, Newsela or Time for Kids and assign them directly to your students through Subtext. Teachers can embed discussion questions, quizzes and assignments DIRECTLY into text! From what I’ve seen so far, students absolutely love posting on assignments and waiting for classmates to comment. Great way to get kids engaged in reading and to differentiate for leveled reading! Great blog post about it, here. Hollywood, beware! Kids are film making and to be honest, some of them are pretty good. There are so many ways that my students and I used iMovie, that I’m sure this won’t be the last time I blog about this app. 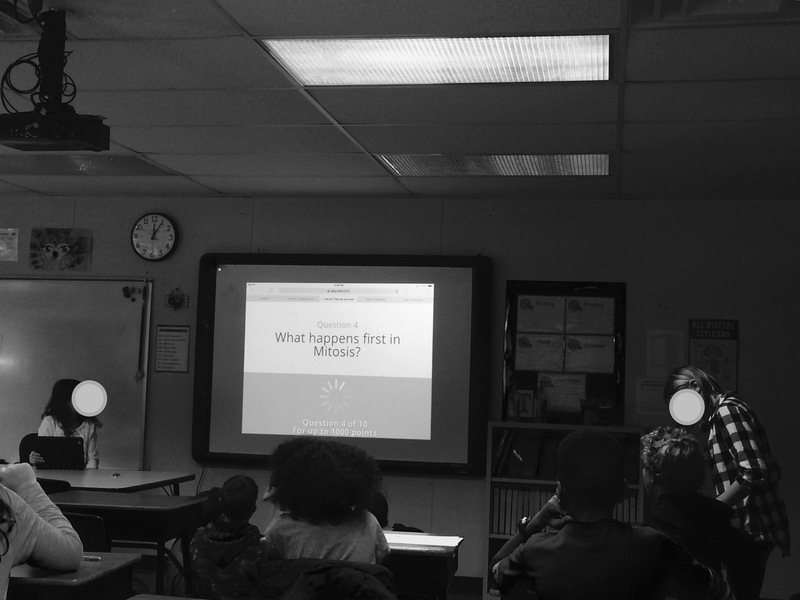 One of my favorite features of iMovie is the movie trailer which my students used a lot to demonstrate understanding of story elements and to create book trailers enticing others to read the book that they enjoyed. This app is so user friendly, that we even created iMovies with our first grade and pre-school buddies! Notability is a wonderful note taking and annotation app that most of my students used as their go to digital notebook. They loved the ability to upload and import any document or picture directly into their note. A lot of my students loved the organization feature of Notability, which is similar to Evernote (another fave) and they were able to organize their notebooks by subject, while each note was time stamped and easy to title. The ability to take quick voice notes is an added bonus! Schoology is another app that I wish I would have known about, last year. As far as a learning management system was concerned, I was blown away by Edmodo, which took care of our class’ needs at the time. However, now that I have found Schoology, I feel I have seen the light! Schoology is very user friendly and allows students to easily access their assignments, quizzes, tests, grades and discussions. The process of turning in assignments or saving documents in the “Resource” folder, is so streamlined and possible from almost any app. Schoology is free, but schools can also purchase licenses for more bonus features. With simple changes in your classroom environment, your can go from boring old 20th century, to exciting new 21st century in a flash! OK, maybe not a flash, but soon enough. 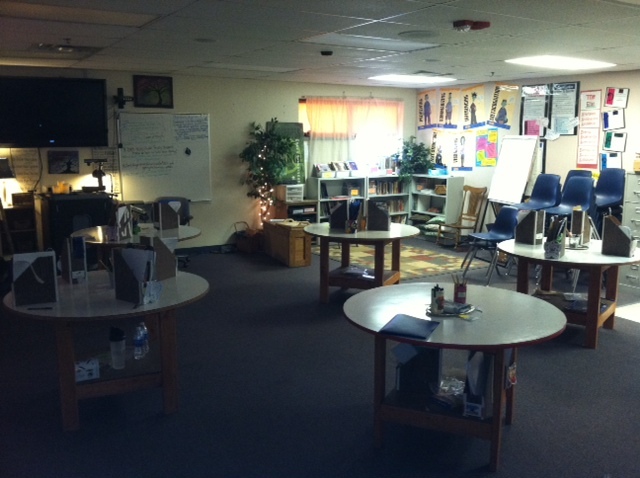 My first couple of steps were simple; get rid of everything that made my classroom look like a classroom. I envisioned a space where I would be comfortable working all day. No textbooks (though I kept my novels on a shelf), no educational posters on the walls, no desks and minimal paper. Handcrafted whiteboard tables replaced desks (whiteboard paint is a great alternative, as well), dry erase markers and erasable pens replaced pencils (goodbye annoying pencil sharpener), word processing and presentation apps replaced paper and student work replaced the useless educational posters that none of my kids ever looked at, anyways. 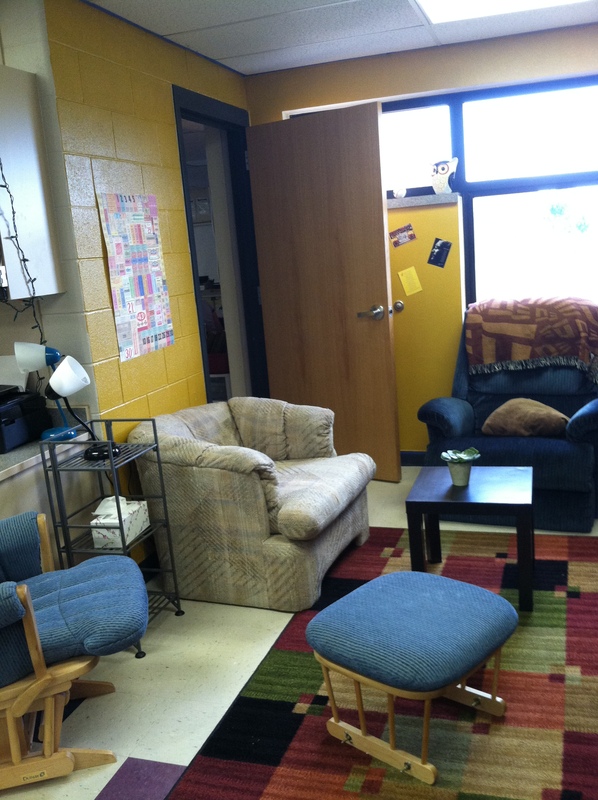 Adding lamps, comfy couches and chairs, bean bags and pillows were a finishing touch. 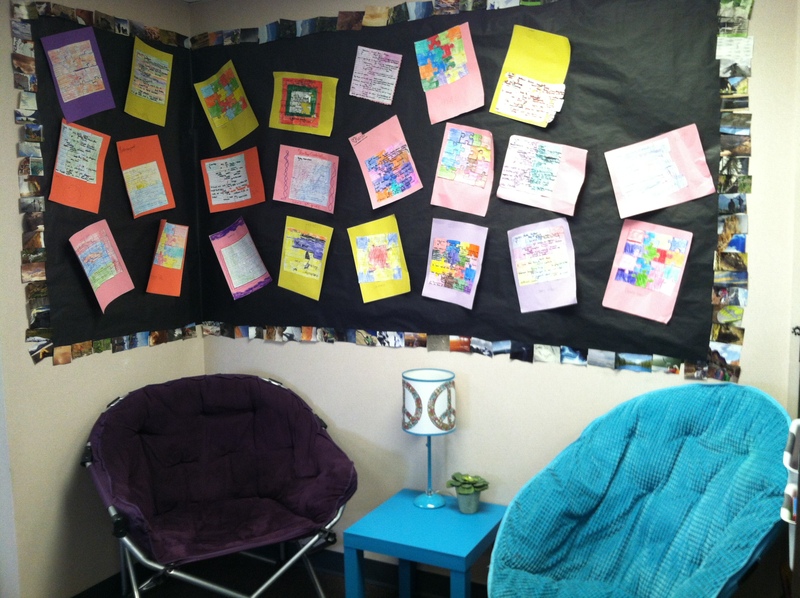 Students FELT different when they walked into my room. They began to relax, become less stressed and more focused on their work. I know this because I had multiple students (and teachers) tell me this within the first couple of weeks of school. Creating multiple student work spaces naturally lends itself to focusing on student creation and exploration, rather than stand and deliver teaching models. 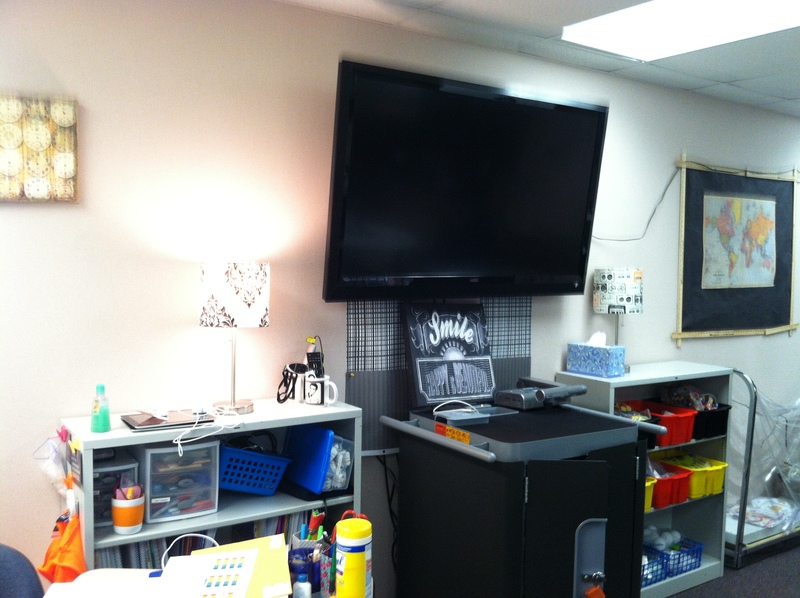 Whiteboard and desks should not be the focus of your classroom, the students should. 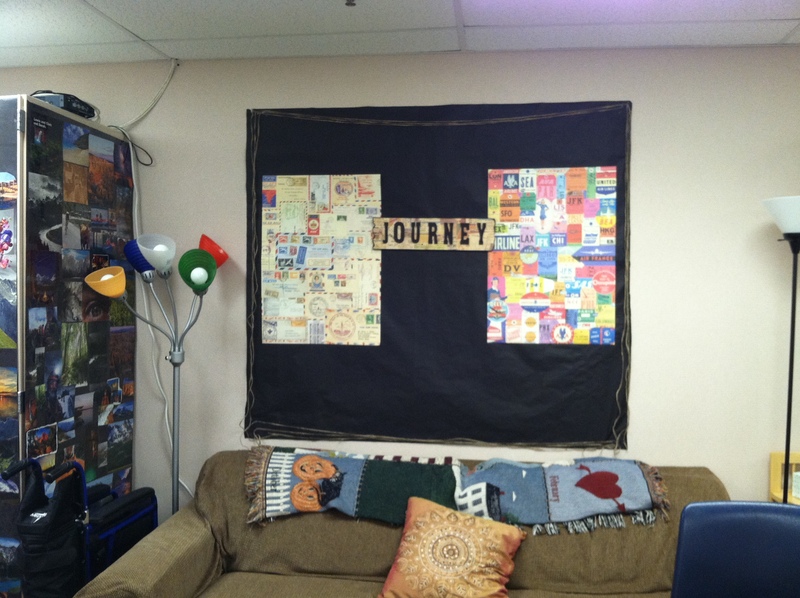 I am fully aware of the fact that I cannot quantify the effectiveness of this classroom environment change, but I truly believe that it led to student success throughout the year. 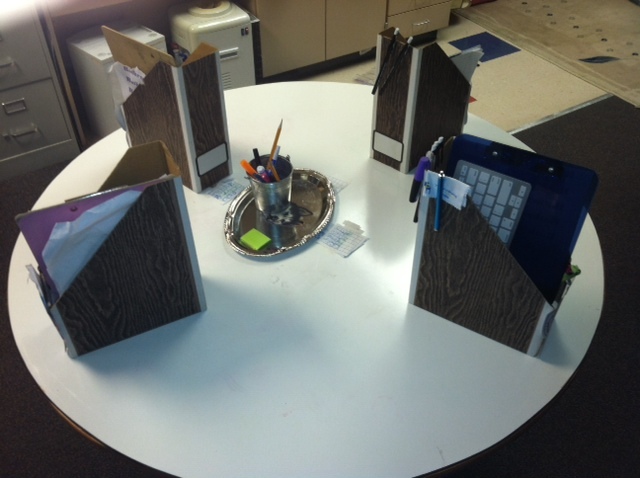 This comfortable work space allowed students to work on independent tasks without distractions. My school used Apple TV’s connected to TV’s and we also connected SMART doc cams to the TVs. 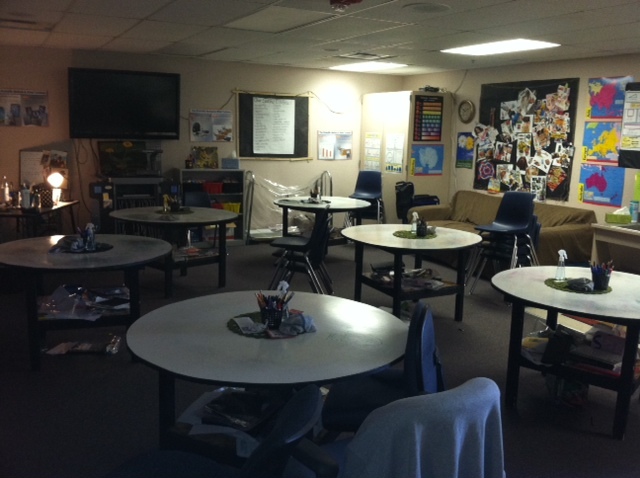 Here is a panoramic view of my classroom set up. 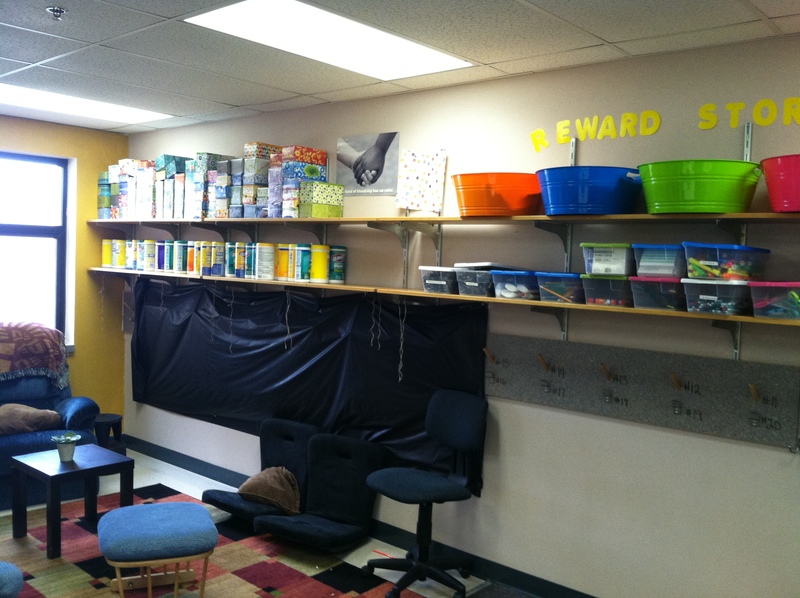 Shared Supplies on Shelves Frees Up Space for Students. 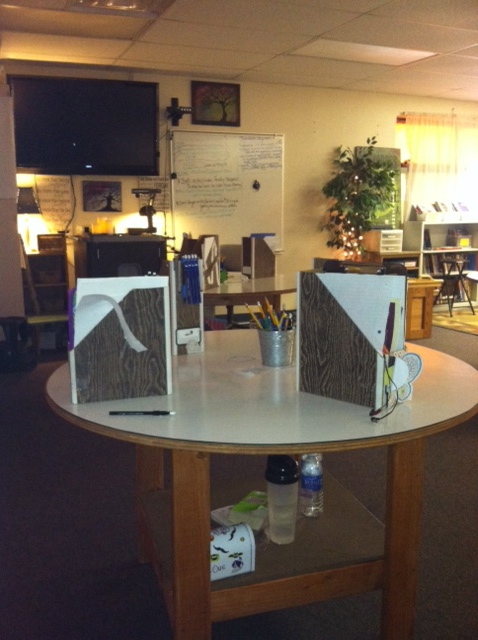 Former Teammate’s Whiteboard Tables with Book Caddies. Not only do whiteboard tables allow for students to display their work, but it’s also fun to write students messages and notes! 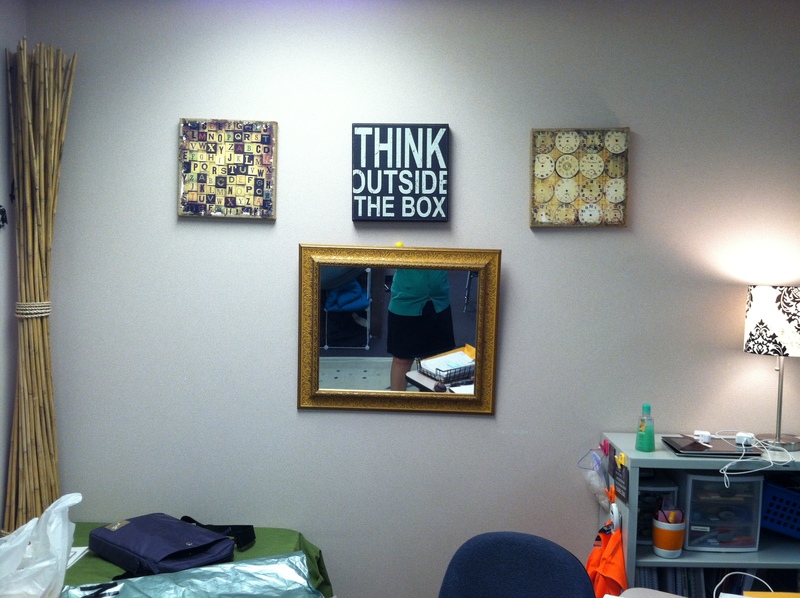 My Old Classroom With the New Teacher’s Finishing Touches.